Harvest 2017, a beautiful year! The production process of Lombardi Champagnes respects ancestral winemaking methods that have proven to yield exceptional wines. At the heart of this traditional know-how is the human hand, whose artful delicacy knows no equal machine. Consequently, our harvests are still conducted by hand. The finest grapes are selected and are immediately pressed upon harvest. Only the juices of the first press, also called “cuvées”, are used in the elaboration of our champagnes. These juices, the purest, are from the pulp of the grapes, rich in sugar and acids (tartaric and malic). They yield wines of great finesse, with subtle flavors that provide excellent freshness in the mouth and a better capacity for aging. To preserve the freshness of our champagnes and obtain the fullest expression of the terroir, we elaborate our wines exclusively in stainless steel vats. As time allows the flavors of the Champagne to be enriched, we see to it that our vintages benefit from an aging of at least 24 months on the lees. For our most prestigious wines (which are currently still aging), maturation on the lees can extend to 7 years and beyond. After this long period of rest, we riddle by hand to give the wine its limpidity. At this first removal of sediments (yeasts and riddling adjuvant), naturally follows the disgorgement which will completely remove the deposit that riddling concentrated in the neck of the bottle. To bring particularly aromatic notes of buttery sweetbread, we then perform a malolactic fermentation upon completion of the alcoholic fermentation. To ensure consistency in the quality of all of our cuvées, we add roughly 20% reserve wine. The Cuvee Hyménée even contains 40% reserve wine. As far as dosage level, we try to add very little sugar to the dosage liquor. For the cuvee brut Axiome for example, we limit ourselves to about 8grams, instead of the usual 12 grams per liter. The cork is immediately introduced after the dosage, upon which the wine enters a new phase of the aging process. The bottles are then shaken (“poignettage”). Their limpidity is controlled (the mirage). They finally return to the cellar for a few months before they are finally put on the market. Associated with the discernible Lombardi style that we would call fresh, pure and precise, our wines each have their own personality and reflect various aspects of the taste palate of our terroir. First of all, although the juice is white, the making of champagne employs both red and white grapes. The juice is white, even from red grapes, because great care is taken so that the grapes do not macerate before being pressed, as is often the case with still wines. To this end, only well-intact grapes are harvested, the time between harvest and arrival at the press is minimized, and special crates with drainage holes are used, all to avoid any crushing and maceration of the grapes. Pinot Noir and Chardonnay are initially separated. If you hear of “parcellaire”, it means that only the grapes of a given parcel have been used to make a cuvée. After the harvest, the grapes are quickly brought to the pressing center. The grapes are weighed and recorded on the press register. The contents of each marc, or 4000-kilogram press load, is identified and recorded, cru by cru (exact vineyard of origin), and varietal by varietal (type of grape). The must, or juice is extracted from the marc, and the “cuvée” is the juice of the first press. This stage is also called “aging on the lees”. The bottles are protected from light and remain in the cellar at a constant temperature of 12 ° C. Composed mainly of yeast, the lees form a deposit in the bottle. At the end of the sparkling process, the yeasts gradually die and undergo “autolysis” (their cellular content is degraded and releases molecules that will interact with those of the wine and undergo slow transformations). During this maturation in stainless steel vats the first fermentation takes place, the must gives way to the wine. Yeasts turn sugars from juices into alcohol and carbon dioxide. They will also participate in the development of the aromas and flavors of the wine. After the alcoholic fermentation, we proceed to a malolactic fermentation. The cellar temperature is maintained at around 18 ° C and the tanks are seeded with selected freeze-dried bacteria. These bacteria of the genus Oenococcus transform malic acid into lactic acid. After four to six weeks, the wines are racked and clarified by riddling. Riddling consists of rotating the bottle successively to the right and left, and then gradually tilting the bottom upwards, sending the deposit into the neck and into contact with the bottle cap. This operation is followed by disgorging: the top portion of the neck of the bottle is immersed in a solution at -27°C. The small ice cube formed in the neck traps the sediments resting there. When the bottle is uncapped, the internal pressure ejects the small ice cube while limiting the loss of wine and pressure. During disgorging, a small amount of oxygen enters the bottle. It will contribute, with the dosing liquor added at this stage, to the evolution of the aromatic characteristics of the wine. The blending of wines from different grape varieties helps to create the complex contrasts and harmonies of the champagnes. 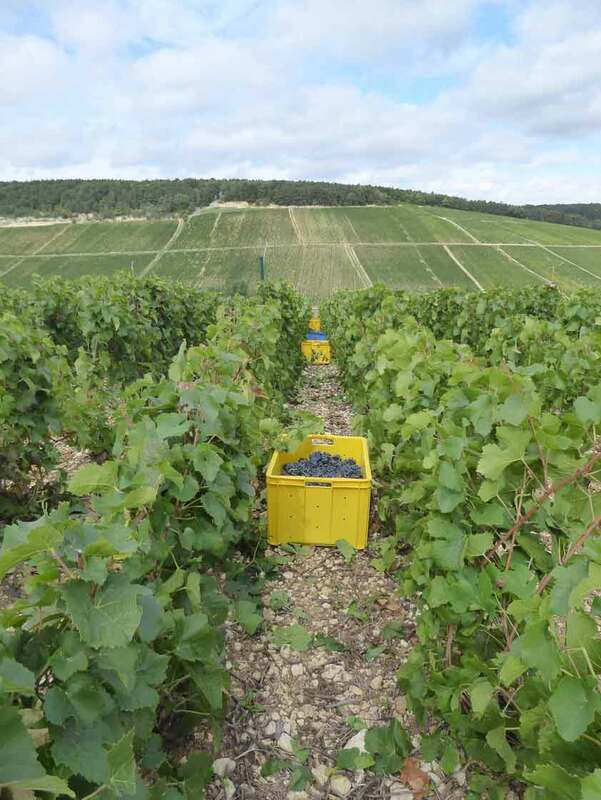 We concentrate on the Pinot Noir and Chardonnay grapes, rather than the Pinot Meunier. With its aromas of red fruits, the Pinot Noir brings a full-bodied strength. Chardonnay, on the other hand, is the grape of freshness and finesse. Young, it offers floral and sometimes mineral notes to the wines. Evolving slowly, it is a perfect complement for aging wines. We add “reserve wine” to all of our cuvées. These quality wines, saved from our best years, are preserved to complete the assemblages and assure constancy across our range and over time. Three parameters are taken into account in the blending of our wines: the terroirs or vineyards of origin, the grape varietals, and the year or harvest. It is possible, however, to work with only one dimension. Vintages, for example, use the juice from only one year, a year considered exceptional enough not to appeal to the reserve wines. Also, using a single grape varietal will create a Blanc de Blancs or Blanc de Noirs with a taste profile specific to that particular grape. The dosage is the finishing touch to the wine before the final corking of the bottle. It corresponds to the addition of a small amount of “dosing liquor”. This liquor is most often composed of cane sugar dissolved in wine at a rate of 500 to 750 grams per liter. The quantity of this liquor used for the dosage depends on the type of wine desired. A dosage of more than 50 grams per liter will give a “sweet” champagne and between 17 and 32 grams of sugar per liter, a “dry” champagne. The “brut” must remain at less than 12 grams of sugar per liter. For contents less than 3 grams, and if no sugar has been added to the wine, the labels “brut nature” (natural brut), “pas dosé” (not dosed) or “zero dosage” are used.